A microscope is an indispensable observation tool in the laboratory and particularly in biology. Dominique DUTSCHER offers a wide range of microscopes suitable for teaching and working routine in the laboratory. Our optical microscopes are efficient, offer a high quality of observation in wide field and benefit from an excellent robustness. Derived from reliable brands such as Nikon and Optika, they come in different formats depending on your needs: straight or inverted, in phase contrast or on a light background, binocular or trinocular. they also offer the possibility of evolving towards a different mode of observation (black background, phase contrast, etc.) or towards fluorescence. - Evolution to trinocular port. Dominique DUTSCHER also offers stereomicroscopes, magnifiers or binocular magnifiers, adapted to your needs. Whether you have a large workspace or a compact design, you'll find the stereomicroscope you need for your observations and precision work. 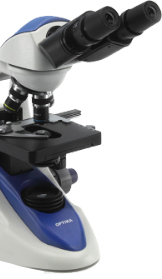 We invite you to contact us for your microscope evolution or for any additional information.